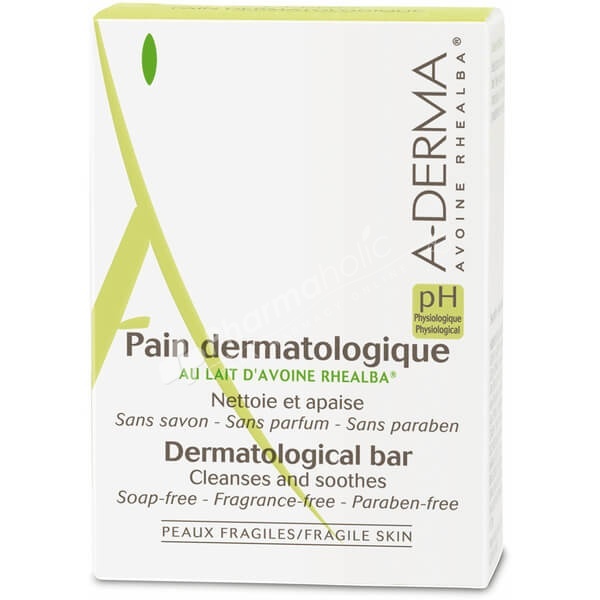 A-Derma Dermatological Bar enriched with Rhealba® Oat Extract delicately cleanses even the most sensitive skin. A-Derma Dermatological Bar delicately cleanses even the most sensitive skin. Enriched with Rhealba® Oat Extract that has been grown under strictly controlled conditions for ultimate effectiveness, the soap-free bar soothes irritated, easily inflamed skin, whilst gently eliminating impurities without over-drying or altering the skin's pH balance. Suitable for use on the face and body, your skin is left clean, calm and restored. Use for daily cleansing of the face and/or body. Lather on damp skin. Rinse with clean water.